We are writing to bring to your attention a publication we have just produced. 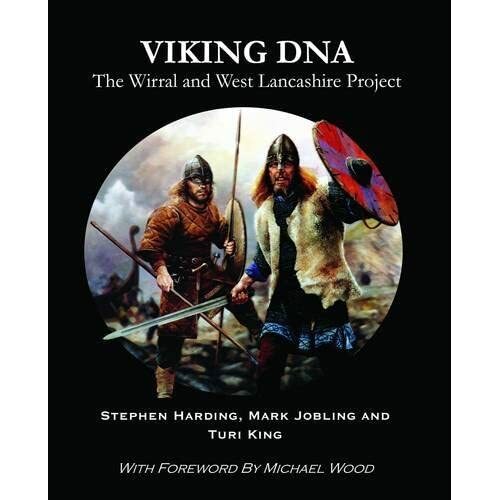 It focuses on the first part of a genetic survey of northern England - the Wirral and West Lancashire project in the northwest - and explains the basis behind the DNA method to probe ancestry, the use of surnames to help to localize volunteers to specific regions of the country, and how genetic methods are being used in conjunction with historical, archaeological and linguistic evidence to learn about Viking ancestry. It also gives some examples from individual results and from comparing populations of people to help show what these new technologies can achieve. Publication of the book has been supported by one of the UK Research Councils who have been supporting the study (the Biotechnology and Biological Sciences Research Council) - and Nottingham University Press in conjunction with Countyvise Limited have very kindly produced this for us and indeed done a splendid job. We would like to stress that we as authors are not taking any Royalties or profit! The book is introduced with a brilliant foreword by famous UK/BBC historian/broadcaster Michael Wood after which we set out to show as clearly as we can, with the help of full colour illustrations, what DNA is and how DNA methods can be used to probe both individual and population ancestry. For probing Viking ancestry it shows the importance of using DNA in conjunction with historical, linguistic, place name and archaeological evidence - again with the help of many colour illustrations, and explains how DNA can be used to probe paternal ancestry and maternal ancestry either for individuals or for populations of people, explaining also some of the sometimes complicated jargon that scientists use. A major problem in studying population ancestry is the large population movements that have occurred since the Industrial Revolution. However there is a strong link between surnames and paternal DNA ancestry and the book explains how information such as Henry VIII's tax rolls, , and even criminal records (including someone - with the same name as one of the authors, accused of killing a dog - and found not guilty!) can be used to help establish the volunteer base for specific regions of northern England. Using these methods significant Scandinavian ancestry (up to 50% of the mixture of DNA from the old populations) has been shown for Wirral and West Lancashire. One youngster from Wirral was so impressed with the results for her father she wrote a School project "My Viking Dad and his Viking Dog"! The book finishes with a look towards the current testing of other regions of Northern England and the research currently being undertaken with colleagues in Norway to study the genetic profile of Scandinavia in the Viking Age. This broadcast on BBC Radio 4 gives some more information about the survey (after the first minute or so). So we think it will be a useful read for anyone interested in DNA ancestry and, after seeing what we have done in the North West, give people from other regions an idea of how their own past could be researched. The book is 150 pages long and extensively illustrated in colour. The book has just become available in all good bookshops in the north West or from Amazon and would make an excellent Christmas present. The DNA Project is being driven by Steve Harding, Professor of Applied Biochemistry at Nottingham University, and one of the authors of the book. The Project was originally stimulated by his interest in his own origin in the North-west and the many associations with Viking names and local traditional beliefs about a Viking presence. His blog, a treasure trove of information about these matters, can be found here.